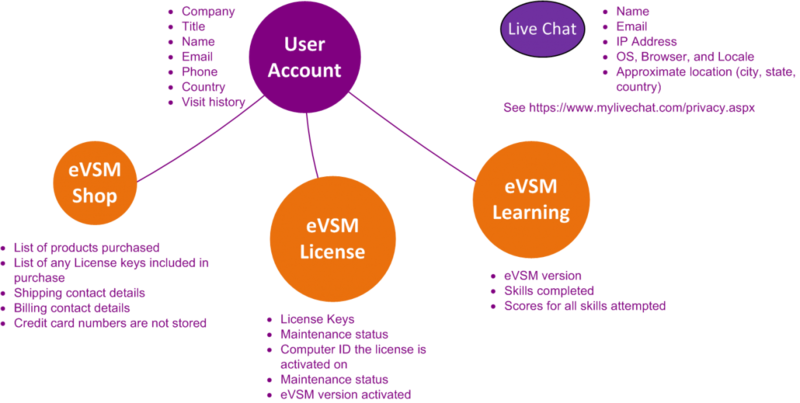 At GumshoeKI (developers of the eVSM Software), we recognize the importance of protecting your personal information and are committed to processing it responsibly and in compliance with applicable data protection laws in all countries in which we operate. In the normal course of its business activities, GumshoeKI collects and uses personal information of various individuals and organizations in order to run its day-to-day operations. This Privacy Notice describes GumshoeKI’s general privacy practices that apply to such personal information collection and use. This Notice limited to customers, prospective customers, and visitors of GumshoeKI. GumshoeKI does not store credit card numbers. GumshoeKI employees cannot access user account passwords. GumshoeKI does not collect, use or disclose sensitive personal information, such as race, religion, political affiliations, etc. GumshoeKI uses your personal information to deliver the services you have requested. GumshoeKI also uses your personally identifiable information to inform you of other products or services available from GumshoeKI, and to contact you with important news regarding the service or your account. GumshoeKI may also contact you via surveys to conduct research about your opinion of current services or of potential new services that may be offered. GumshoeKI does not sell, rent or lease its customer lists to third parties. GumshoeKI may, from time to time, contact you on behalf of external business partners about a particular offering that may be of interest to you. In those cases, your unique personally identifiable information (e-mail, name, address, telephone number) is not transferred to the third party. In addition, GumshoeKI may share data with trusted partners to help us perform statistical analysis. All such third parties are prohibited from using your personal information except to provide these services to GumshoeKI, and they are required to maintain the confidentiality of your information.